Canada's veteran show jumper Ian Millar may not be able to compete at the Rio Olympics after his top horse was forced to undergo surgery. Ian Millar might not be on Canada's Olympic team in Rio because he's lacking a proven horse. The 69-year-old show jumper from Perth, Ont., set an international record for appearances at the Olympic Games with his 10th in London in 2012. An Olympic team without "Captain Canada" would be unusual. But Millar's top mount Dixson has undergone a pair of sinus surgeries since March and won't be available to compete in Rio, Millar said Tuesday at Calgary's Spruce Meadows. "He's definitely out for Rio," he said. "If he's out for a month it takes two or three months to get him back. This horse has been out for a long enough time that I think we'll have him back for September, but we won't have him back for Rio." So Millar needs a solid international mount with less than two months to go to the Aug. 5 opening ceremonies. 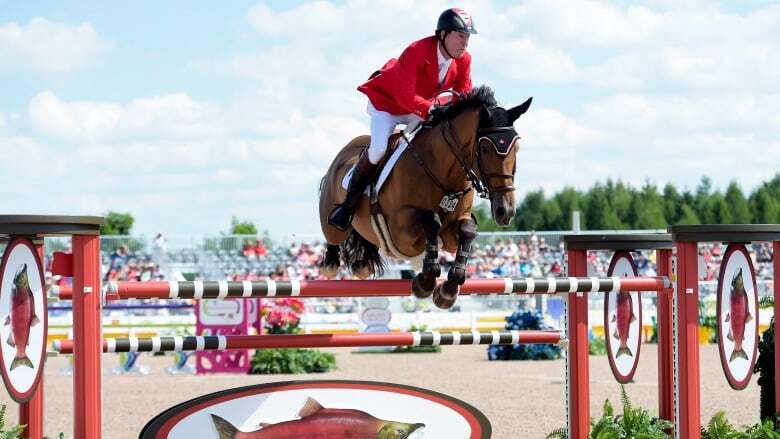 Canada's show jumping team for Rio is expected to be named in July. The veteran rider says his top prospect Teddy du Bosquetiau, or "Teddy B", needs a breakout performance at Spruce Meadows to earn consideration for the Olympic team. "He would have to come on in a very spectacular manner to impress the [Jump Canada] committee enough to put him on the team," Millar explained. "If Dixson was here, all they would need to see is if Dixson is on form and then they're going to be comfortable. "Dixson had nothing to prove. This horse, Teddy B, would have something to prove. So we're going to prove it." The National, which kicks off four straight weeks of competition at Spruce Meadows, opens Wednesday. The tournament includes Saturday's $500,000 RBC Grand Prix and Sunday's $175,000 CNOOC Nexen Cup Derby. Millar, Eric Lamaze, Jill Henselwood and Mac Cone won Olympic team silver in 2008 in Hong Kong. Lamaze won individual gold there. If Millar can't compete in Rio, he'll aim for his 11th Summer Games in Tokyo in 2020. "I'd just have to do it the next time," Millar said. He says daughter Amy or son Jonathan, also competing at Spruce Meadows, could represent the family in Rio if he can't. "My son and daughter both have a strong possibility, so I go as a rider, I go as a trainer or I go as a father," Millar said. "I'm still going to go. If all else fails, I'll go as a commentator." Millar and Dixson helped Canada win Pan American Games team gold last summer to qualify for Rio. "To not have Ian ride at the Olympics would be a big, big loss for our team," Lamaze said. "To go to a Games without him is not a reassuring moment. "We have fantastic riders and I'm sure we can put a very good team together, but all the great success I've had as a team rider has been with him." Millar and Dixson, a 13-year-old bay owned by Sue and Ariel Grange of Lothlorien Farm, posted three clean rounds to claim the $1.5-million CP International at Spruce Meadows in 2014. When it became no longer possible to manage hematomas in Dixson's sinuses with other treatments, surgery was the only option left, Millar said.